There's a lot written about packing a healthy lunch for work to avoid the deli/cafe trips. But what if you work at home? One of the hardest parts of this whole mindful/healthy eating thing for me concerns the very question of preparing and consuming a lunch a few feet away from my "office." In the myriad hours I spend alone each weekday, figuring out the balance of work/eat/dog/exercise/housework/chores/relaxation, the question of lunch both excites and irritates me. Get up around 7, read the news over coffee. Have breakfast with son (hub leaves the house around 6:30 - and I can't seem to get out of bed that early), get son to bus. 8:00 - feed animals, clean kitchen, read emails. 8:30 -10:00 work (writing/editing/posting/business-related work). 10:00 walk dog. 10:45 - noon work on novel. Noon - eat something that needs minimal prep/clean up and that is wholly satisfying. 12:30 - 1:00 meditate/rest. 1:00 - 2:00 some sort of exercise. 2:00 - 3:00 review writing/edit. After 3:00, I'm toast when it comes to cranking out work or editing. It's a good time to do chores. The problem with achieving my perfect day is that lunch thing. I really don't want to spend more than a half hour with the whole business. Sometimes the very thought of the steps involved in creating a mindful, wholesome meal makes me want to get back into bed. Truth: I hate prepping and assembling the quotidian midday meal. I don't mind making a huge project out of food, but somehow tedious tasks like measuring mayo into my tuna salad and tearing lettuce off a head, washing and drying it to get the grit out, chopping, peeling, and mixing in service to, say, a tuna sandwich and orange slice lunch, fills me with boredom and dread. It's then that I most want to do the counter-intuitive, time-wasting and expensive alternative: get in my car and go somewhere for lunch. In the morning, after my first cup of coffee, when I'm typically cleaning the kitchen, I've been pre-prepping the tuna salad/lettuce cleaning/chopping veggies thing. I've found that if I do this before engaging with work I feel less disrupted. I'm actually behaving as if I work at an office away from home and have to pack a lunch. Somehow prepping stuff for assemblage in the morning feels less punitive than it does at noon. Maybe because I'm usually really hungry at noon and I'm dealing with blood sugar crabbiness? Hmmm. Oh - and the lettuce thing. The husband came up with this cool idea for boxed lettuce. A sheet of paper towel on the top, then flip it over for storage. Our lettuce lasted all week. 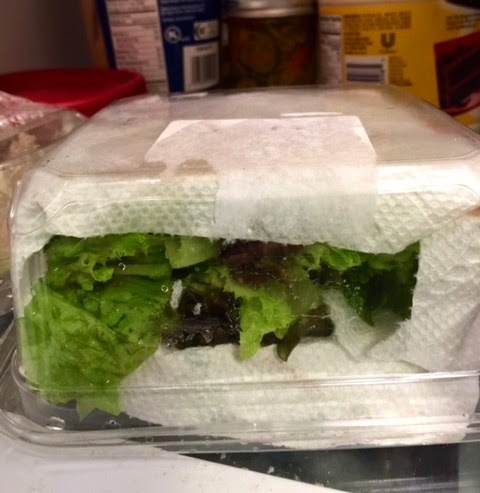 As for the heads of lettuce - I saved the container and washed/tore/dried the lettuce and stored it in the recycled paper towel-lined lettuce box. Looks like we're about done with week one! I have some new ideas for week two, so stay tuned for tomorrow's episode when we'll talk beans and I'll put together a potential shopping list.